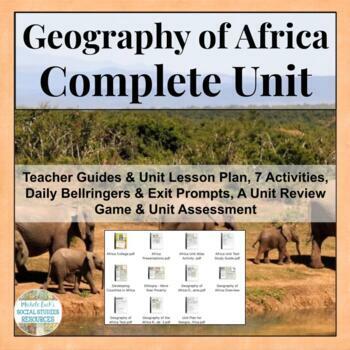 Are you looking for a complete unit for the Geography of Africa? This is it! 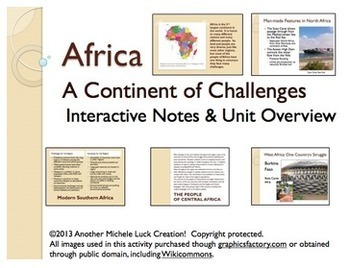 This is a complete 10+ day unit for the study of Africa in a Geography or other Social Studies course. Includes a unit/lesson plan, student-centered activities, learning centers, online interactives, all student materials, and more. 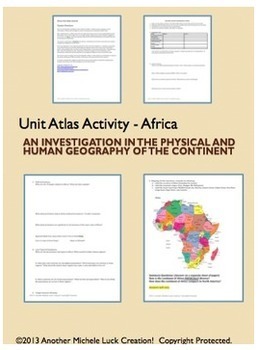 Unit covers the physical geography of Africa with mapping and atlas investigation activities, the human geography and a cultural study through the use of news articles from African outlets, a study of the regions of Africa through visiting centers or a response group activity, and an online interactive investigation on the Environment of Africa. All activities are student-centered and require higher-order thinking skills. Students will also practice basic geographic and social studies skills throughout the unit. Reading and collaborative group assignments will help with student literacy and the unit will address most state and the national standards. A teacher unit plan is provided with daily suggestions for bell ringers, homework, and exit slips. 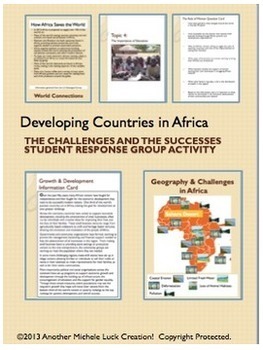 An end of the unit assessment is included, requiring students to make decisions about the culture of Africa and to prioritize significant information to create an online collage with an essay option. Unit project could easily be adapted to use without online access. A complete Unit Test is also included with multiple choice, response, and mapping. A study guide accompanies the test for student preparation. Teacher directions are also provided, as well as ALL student and activity materials. Many of the student handouts include graphic organizers and wrap-up questions to help students better prepare for assessments. Save over 30% when you purchase the whole unit! This would also be a great introductory unit for an African History course or World History course study of the region. Save even more by purchasing this as part of my World Geography Complete Course! Please see my store for other Geography, World History, and U.S. History Complete Units and individual assignments, activities, and games!